Queen for a Day :: The original reality competition format is back! "Would you like to be Queen For A Day?" For over 20 years, this question could be heard in American households five days a week, as it introduced one of the most popular television shows during the1950s and 60s. ... AND BETTER THAN EVER! Queen for a Day is one of the most successful shows in the history of Television running from 1956 - 1964. Queen for a Day was the first reality TV show. 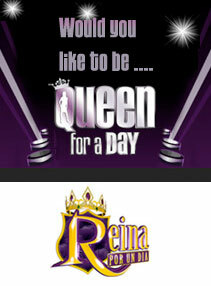 Reina Por Un Dia is the spanish version of the Queen for a Day. Reina Por Un Dia thrilled spanish speaking audiences and enjoyed excellent ratings. The future of Queen for a Day is bright! A new version is in the works and the updated version has the emotional spark missing in today's reality competition shows.